It could be the perfect time to add these income-friendly stocks to your forever portfolio. It's been shown that dividend-paying stocks outperform their non-dividend-paying peers, but not every dividend-paying company deserves a place in a forever portfolio. Sometimes, high dividend yields can spell trouble, and as we've recently seen with General Electric (NYSE:GE), dividend payouts can disappear at even the largest companies when a business stumbles. We asked three Fools what dividend stocks they think have what it takes to continue returning cash to investors for the long haul. They responded by recommending A.O. Smith (NYSE:AOS), 3M (NYSE:MMM), and Microsoft (NASDAQ:MSFT). Are these three dividend stocks right for your income portfolio? Maxx Chatsko (A.O. Smith): Water heaters are a staple of modern living in households in the United States, Europe, and, more recently, China. That bodes well for the long-term success of A.O. Smith, which is one of the leading suppliers of water heaters in the world. Yet while it has been one of the absolute best buy-and-hold stocks on the entire stock market since 2011, shares have uncharacteristically lost 25% of their value since the beginning of the year. That signals an opportunity for long-term investors, especially considering the dividend yield sits at 2.1% -- the highest level since 2009. Why is the stock down 25% this year? Well, Wall Street was worried that the trade war between the United States and China would have a detrimental impact on the business. While that didn't play out in the first half of 2018, A.O. Smith reported third-quarter earnings results that showed signs of strain. Management reduced full-year 2018 guidance and told investors to prepare for lower growth in the near term as a result. That will surely sting -- or maybe it already has, given the stock's haircut this year -- but investors may discover reasons for optimism. A.O. Smith stock now trades at 17 times forward earnings, which is the lowest valuation in the last five years. The trade war headwinds affect the all-important growth opportunity in China, but the North American replacement water heater market is as rock solid as they come and should anchor the business no matter where the economy is headed. Plus, through all of the year's volatility, the company has maintained a healthy cash balance while repaying debt, buying back shares, and pouring record amounts of cash flow into dividend payments. If that continues, then this stock should boast an above-average dividend yield soon -- and one with above-average growth prospects from tapping into long-term growth in China and India. Travis Hoium (3M): Past performance doesn't necessarily predict future performance, but in the case of 3M's dividend I think it's a great sign of what's to come. 3M has now paid a dividend to investors for over 100 years without interruption, through recessions, wars, and market collapses. What makes 3M's dividend so durable is the company itself. 3M makes products that serve consumer goods, the medical field, industrials, energy, and nearly any industry you can think of. Its products are diverse and that means it isn't susceptible to competition or a downturn in any specific business. 3M's business has also been an incredible cash generator. 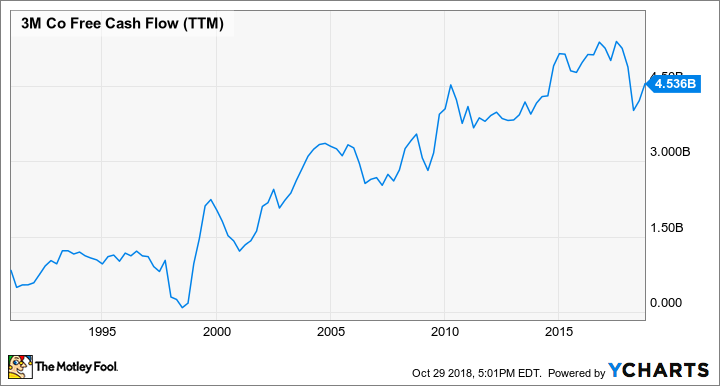 You can see in the chart below that 3M has been able to grow free cash flow over nearly three decades (as far as this chart goes back) and is near the peak of its cash generating powers. A focus on operational efficiency and areas that are high value-add is how 3M maintains such strong cash flows. 3M's current dividend yield of 2.9% isn't going to be the highest on the market, but it's more durable than most dividends today. I think 3M's diversification and strong cash flow make this a dividend investors can count on for life, which is saying something in a highly volatile stock market. Todd Campbell (Microsoft): Innovation threatens technology companies that are slow to adjust to change, but it rewards companies that embrace it, like Microsoft. In the past decade, Microsoft's transformed itself into a video gaming and cloud-software giant from a personal-computer software Goliath. It could've rested on its laurels, but if it had, it surely would've been surpassed by competitors when demand for PC and enterprise software shifted online. Instead, it plowed big money into projects, including next-generation video gaming and subscription software, and those projects have more than offset waning demand for its legacy products. Last quarter, rapid growth in its productivity and business processes segment and intelligent cloud segment allowed it to grow revenue 19% year over year to $29.1 billion and its net income by 34% to $8.8 billion. Growing adoption of Office 365 and LinkedIn supported results in its productivity unit, while demand for cloud software used to build, test, deploy, and manage applications and services at Microsoft data centers boosted the performance of its intelligent cloud segment. In its personal-computing segment, the ongoing weakness in PCs was offset by 44% year-over-year growth in gaming revenue, which continues to benefit from growth of in-game purchases. Innovation isn't going to stop, but Microsoft's proven to me it knows how to pivot when necessary. Given its shareholder-friendly past -- it returned $3.5 billion in dividends to investors last quarter alone! -- and its willingness to invest in change, I think it's a company that will continue to reward you in the decades to come.